ESCR-Net (The International Network for Economic, Social and Cultural Rights) connects over 280 Members in 75 countries, together building “a global movement to make human rights and social justice a reality for all”. 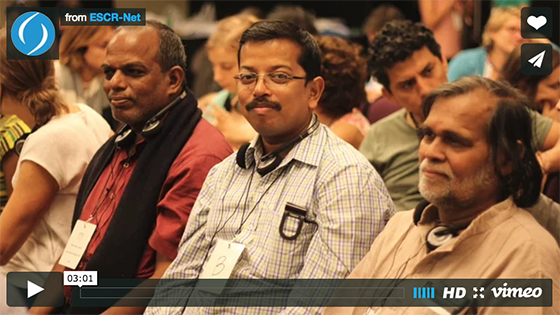 More than 140 representatives of social movements and civil society organizations from over 40 countries came together in Buenos Aires, Argentina, from 15-19 November 2016 to review the network’s progress over the last three years, discuss global systems that perpetuate inequality, impoverishment and dispossession and explore what transformative, collective action ESCR-Net Members should undertake to realize economic, social and cultural rights in the coming period. ESCR-Net members affirm support for Common Charter for Collective Struggle. The Network takes significant steps towards new strategic plan. Celebrating the success of the campaign for the Optional Protocol to the ICESCR. Remembering those who could not attend. Thank you for making the meeting possible!